Twisted Sister: "Home" Quilts and a Give Away! "Home" Quilts and a Give Away! One fat quarter bundle of my fabric line "Home is Where Your Story Begins," by Hoffman Fabrics. Bundles were mailed to a list of my artist friends to create a 16x16 quilt, in their unique style, out of my fabrics, for me to share at Quilt Market. I am pleased to be able to share with you the results of their labors. Let the fun begin! 13 different fabrics. You can click on the photographs to see them larger. I think that the artists did a fabulous job using the fabric in their own styles! I loved sharing them in my booth. I think it's always great to show another perspective, other than just mine. Thank you everyone for your amazing quilts! This is so difficult! I love your fabrics and love seeing what everyone has done with them. I think I'd make a mug rug or wall hanging (Like Mary Lou did), something where I could see it every day. The fabric makes me smile. a quilt for my sewing room? a really fun tote bag to drag my stuff to guild meetings? thanks for the chance. Oh, definitely a wall hanging of some sort. These fun fabrics need to be SEEN. All these mini quilts are so fun and show off your fantastic fabric. I think I would make a bag so I can enjoy your fabric every day. Enjoy your holidays! Congratulations, Elaine! You are the winner of the fat quarter bundle. Please email me at jamie.fingal@gmail.com to give me your mailing address! Whoohoo! After seeing your last post, I would definitely take a look at a piece of furniture in this old house and see how I could perk it up! I would make a wall hanging "Home is Where Mom Is"
I would make a great tote bag for all my fun quilting outings. I'd make a "House Project" quilt ! I think a very traditional Baltimore album block would be great fun in these! I honestly have no idea what I would make but I know it would make me smile! I may make a game board quilt from this great fabric. What fun to play a game on a quilt! Hey Jamie, I'd make 1) a 10" raw edge appliqué Jamie style, square for my "Design & Inspire" Soft Book that I refer back to when wanting or needing inspiration or just a reminder of some of the techniques I've tested. I take it to all my Sew In's and lots of girls swoon over it. 2) I'd use some to make a scrappy Victoria Findlay Wolf square to add to a quilt. 3) I will make a small zipper bag to carry my sketch pencils and pens for zentangle. 4) I'd use the last bits to decoupage the cover of my current Art Journal.... Whew! And I'd enjoy every minute of it. I'd love to win, but if I don't rest assured I'll be ordering some from someplace! I would make an apron using lots of embellishments and crazy quilting embroidery. Every time I see a project with your new fabric line I am so frustrated by the wait until it comes out. Oh random number generator please be Kind, I would love to make a small quilt like these. I would make those fabulous shoes you have on your blog, plus I would use the remainder to make an art quilt for my entryway to welcome people. Such bright beautiful colors - Love the wholeline. Not sure, I would have to lay them all out and let inspiration come. I love the bright colors and modern prints. It would be really interesting to splash some pretty batiks in with them! With these bright happy colors and wonderful inspirational sayings, an art quilt for my sewing room would be created with this bundle. Oh, I would be so happy to win these wonderful fabrics! I want to make some Jamie type shoes with the fabrics and a bag to match as well as some bracelets and earrings. All my friends will be envious . . . what fun that would be! Thanks for the opportunity. I would create a wall hanging for my new studio space so that it could begin to become a joyous spot like yours. I think a Home Is Where The Heart Is wall hanging would be in order! Jamie, your projects and fabric are so full of joy. I can imagine beautiful hangings or a baby blanket. I would enlist my daughter in law's input because the colors are perfect for her. Maybe we could make appliques for family/team jackets. The fabrics just beg to be used in so many projects. I however am making baby quilts and other things for the Mom's to use (my two granddaughters are the Moms) Seat covers for the shopping carts when the babies get to sitting up good come to mind. I love the fabrics! I think I would make a quilted tote bag and a wall quilt of some kind!! I would make small travel bags for several of my fiber art friends. Your colors are wonderful! I like the idea of giving the fabric to my friends and seeing what they create, so I'd probably do that. P.S. I'm the one who won you quilt with this fabric at the silent quilt auction in Houston. I just love it! I just LOVE those fabrics!!! I would sew a wallhanging with bright and wonky birds!!! I don't want to be picked because I've already been fortunate enough to play with this great fabric! I just want to say thanks for your friendship and being a part of this collection of quilts. It was such fun to work with! I would make a nice big wallhanging, I love what your friends did with the fabric. I would have trouble working out the absolutely BEST thing to do with it. Likely though I would go for a bag. I love the vibrant fabrics and the quilts look great. I would probably make a bag if I am lucky enough to win. What great colors and patterns! I would like to make large tote bag or some colorful placemats or mug rugs. I have been enjoying all the cool stuff you have been making/decorating with your fabric collection! I might use some of the fabric to make a bag and who knows what else I might make! Love all the bright color! I love Jamie's fabrics! I would love to use it in an I-spy quilt or book. I could make some wonderful mug rugs and pincushions for my quilting friends. I would also make some journal covers. The fabric is wonderful. I would love to win! Love the colourway for your fabric line! The first time I saw the text focus fabric I thought it would be perfect for an inspirational quilted wall hanging for my granddaughter. She could wake up each day and see a different word and focus on how colourful this world can be! That is what I gotta make! There are so many projects you could make because of the fabrics versatility, the best part is all the text! It is so creative. I would make a cover for a 3-ring binder (which holds a few of my quilt patterns) and a zipper pouch to hold my sewing/quilting notions. What a fantastic collection of little quilts. Stunning! I think I would have to make a crazy quilt with these lovely fabrics. I love fabrics with bright colors and fabrics with letters and words. I think I'd like to make a lunch bag for my daughter with the fabric whether I win or not. i have never before put on my wish list a specific fabric - but this line is what I want for Christmas! want it bad enough to be happy with a gift certificate for it since it won't be ready to sit under my tree. the tea/coffee cups are my favorite but I love them all! I plan to use this fabric to make a bright banner for my daughter's art room. She will love the words and the beautiful colors! I would make a new art quilt for my studio...we are moving back to my hometown in January...where my heart is! A new artwork for a new beginning. Such amazing fabric!!! I would love to make a wall hanging to wake up my windowless cubicle. I work with preschoolers and the colors, pictures and letters would really appeal to them. Thanks for the wonderful giveaway! I would make a houses wall hanging. I love yours. So, let's see if my comment will work from home. I would make a quilt, of course - a Jamie-inspired quilt! Your fabric is just so adorable! I love houses, especially happy houses. Your houses are so fun. I would make a quilt to ho on the wall behind my couch because my family room needs some cheering up. Thanks for this great giveaway. Oh such beautiful bright jewel toned fabrics - I think I would have to make a couple of huge floor pillow for my daughter, who spends alot of timel yiing on her bedroom floor reading. Thanks for the chance. I would make lots of nice little things for my grandchildren. There is so much to discover in your beautiful fabrics! Hey Jamie... I have been following fabric lines and many newly introduced designer ideas and colour palettes and yes, the "movement" for so many years (1979-present). Never have I seen a palette of fabrics designed by one person that impacts my imagination more than yours... HOME is where the heart is, where we WANT to travel in our little trailers and gather with good friends... in colour and darting pattern and light. Inspired for sure. 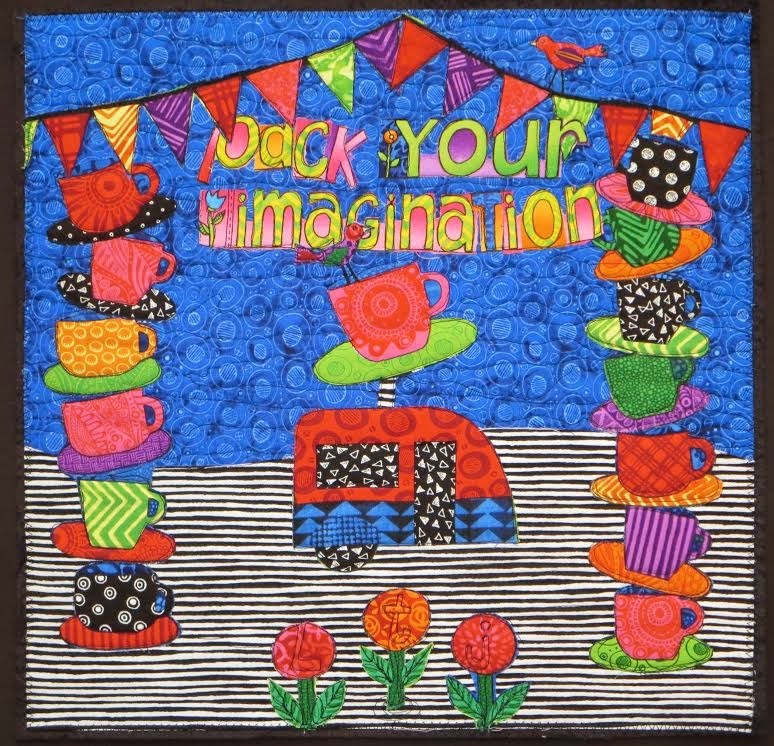 I would love to make small quilts for all of my five granddaughters to inspire them to be the best that they can be - to DREAM big and speak out in fabric - to make the world fun and spark the imagination of their friends with colour, pattern and bright dancing FUN!!! Your fabric packet could do that for all of us... I would so happily spend the winter stitching and smiling all the way to the finish. I would make some home wall hangings, seasonal for summer probably. My house is lacking in summer quilted decor! I'd love to attempt a wall hanging. Love your work!!! I see a myriad of projects in this bundle of wonderfulness! Postcards, change purses, wall hangings, furniture decorating, shoe decorating and the list goes on! Thank you for the give~away and for sharing your art with us. I would make a tote to carry my projects in, so I could show off your gorgeous fabric. It would probably be a wallhanging and the mad hatters tea party comes to my mind, am waiting patiently for it to arrive in the shops in uk. Happy Christmas. Your fabric line is SEW awesome!!! Since the hubs and I both can't sleep lying flat we spend a good amount of time in our recliners. So thinking maybe some travel size pillows and lap quilts to add some much needed color to our tan & brown living room. Thanks for the chance to win! Your designs and use of color is always inspiring. I would love to win it! I think I'd like to make something for the wall in my studio. I love your words! I think this fabric is wonderful for making pillows for the new bench in our garden. I love the sparkling bright colors! I think this fabric would be fantastic for a purse. The colors are perfect for beads as well. The colors are wonderful!! I love these bold and colorful fabrics! All the artists did such a great job with your challenge. I'm into making small things lately and these fabrics would make great bags or pillows. How can anyone look at your fabrics and not break out into a big smile? I would use them as the basis for a happy sampler quilt made from next year's lotto block patterns. I would create prayer flags to soothe my heart and soul, and smile as I thought of the happiness spreading in the wind. Colors look great for a baby or child's quilt. I need an iPad cover. Your fabric will be perfect! Can't resist! Just love all the bright colors! Bright colors would make an awesome table runner to celebrate an outdoor event this coming summer! I would probably make some fun bags out of this fabric. Thanks for the chance! Imagination combined with your fabric could result in an infinite number of different creations. I love the prints and colors and love seeing what your friends made. My fun side would emerge and I would make gifts for friends and family from this bundle. I like the idea of making a mini quilt to hang as inspiration for those down days! Jaime, I love the colorful words. The possibilities are endless. I can't wait to play with the fabric and colors. This was such a tease. What delightful quilts! They each have such different personalities. That's tribute to the artists and also to the versatility of this fabric! I think I would make a scrappy jacket. I'm a teacher and I like wearing clothes that keep my students awake. Thanks for the fun giveaway! Such wonderful quilts! I know I missed the give away but I wanted to tell you how fabulous the fabric, I am anxious to get some for a special project or two. Have a great holiday season.